“Hey that’s a cool tank! Is it an RTA, RDTA, RBA, GTA, Sub Ohm tank…” The world of vaping is changing and evolving at an alarming rate. Now more than ever we are very much in a buyers’ market with more available to us than ever before. With choice comes confusion and the topic of conversation today is all the various types of “tanks” that are on the market. When I first started vaping I was using the simple clearomiser type tank, many of you newer vapers probably won’t know what that is but it is really where it all began. Before the days of sub 1ohm coils and 200w+ devices, things were very different. Nowadays however there is a plethora of different products available on the market. “So, what is the purpose of this post?” I hear you say? Well I am going to delve into the different styles of tank that we have access to. Ranging from your “prebuild replaceable coils”, all the way to your “Tank / RDA” hybrid type tanks. 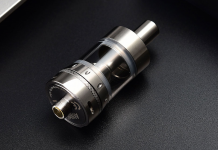 Let’s start with the simpler to use tanks available, known as Sub ohm tanks. These tanks are the most accessible and easiest to maintain of tanks. They are available in various sizes, capacities and resistances (see more on resistance in my last blog about mechs). They all however share a common rule, they are all less than 1ohm. These tanks are easiest to maintain due to the fact that they have a coil and cotton that is prebuilt and in a unit, that is inserted into the tank (usually screwed in although not always) and you prime the cotton and away you go. Nice and simple. There are however some downsides of these tanks. Let’s say you want to change flavours and like me you chop and change a lot from desserts to menthols to fruits. Although it’s not essential, it is recommended that when you change flavour you change your coil head to avoid the two flavours mixing up. No matter how much you clean your tank you are always going to have the old liquid saturated into the cotton of the coil head. This could mean your nice vanilla milkshake liquid that you are about to fill the tank with is instantly contaminated with that Malaysian ice mango that you had in before……not a good combo! The next issue is the price involved in these coils. Some of the coils can be quite expensive depending on the tank and they may not last all that long. Again, this is down to liquid preference as you may have a sugary juice that just kills coils. So, when it burns out and stops performing, rather than just changing out the cotton, you have to swap the whole head which is a bit of a waste. Also, you will occasionally get a “bad coil” which is a total waste of money. Unfortunately, these coils are mass produced for pennies and therefore you will occasionally get a dud, that’s life I’m afraid. The positives however of the sub ohm tanks is that you don’t need any real building knowledge to get a fantastic vape. You can go in to any shop and buy a new coil (of various styles) and it takes away the element of you having to learn to build, easy peasy! It is also great that if you are in a rush and you don’t have time to rebuild a different tank, you can throw in a coil and jobs a goodun! and through and I like making my more complex coils and wicking myself. The RBA is a continuation of the sub ohm tank. 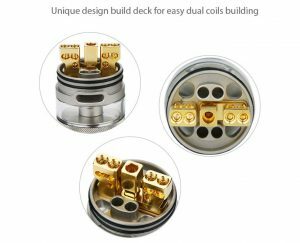 Many sub ohm tanks now come with a“deck” that replaces the screw in stock coils and allows you to make your own coils on it. This is the best way to get into building as it allows you to have a backup coil if you mess it up but it also allows you to start playing with building your own coils. 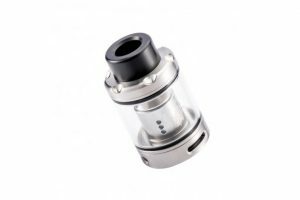 Many sub ohm tanks come with various RBA configurations that allow you to delve into the world of full blown RTA styles but retaining that option to screw in a coil. This is a great trade-off between the two, but very rarely do I find a sub ohm tank with RBA that matches the performance of a dedicated RTA tank. I have found one or two, but if you are a competent builder I suggest you head for the RTAs on the market. A very popular RBA type tank is the TFV range by Smok. 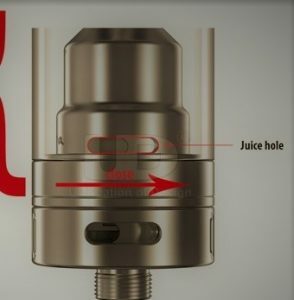 Above is an image of the latest TFV8 X-Baby which has various RBA sections available. This is my favourite type of tank as I find the vape to be quite warm and I build best on something with juice that flows downwards to the coils. Gravity is my friend. 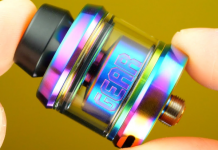 A great new RTA on the market is the Advken Manta RTA. I have one of these on the way and it looks a very promising tank! 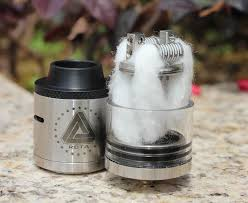 RDTA is a cross between an RDA (rebuildable dripping atomiser) and an RTA (Rebuildable tank atomiser). 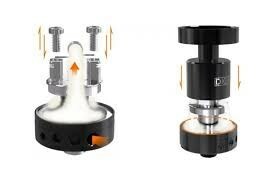 This is supposed to simulate the experience of an RDA (where the coils are right near the mouthpiece and the vapour has less distance to travel) but with the convenience of a tank of liquid so you do not have to drip all the time. The coils are located at the top of the tank and the liquid is always below. With the limiteless you can see the slots in the side of the topcap that line up with the coils and provide your airflow, but the wick still goes down in a cut out of the deck to allow the juice to flow up. 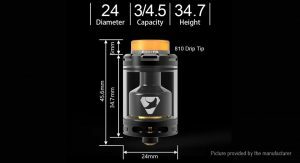 This is not my favourite type of tank as gravity can be a pain when using thicker liquid and I tend to vape at quite high wattages and I find that the juice down not wick quick enough for me when chain vaping. That being said some people have a fantastic vape off this type of tank. Many moons ago there was a type of tank whose name is the genesis tank. They traditionally user stainless steel mesh as a wicking type over cotton or silica (you probably have never heard of silica but it’s basically an absorbent rope type material that was resistant to burning. I absolutely HATED the stuff, but that’s for another time). The way that they worked was to allow the juice to flow up the mesh and to the coils. The new style of GTA is strange one to describe. Basically, it refers to a sealed deck which is different to the RDTA above. The wick hangs down into the juice to wick a little like an RDTA. As you can see the juice flow up to the coils like an RDTA but there is a chamber around the coils that allows for bottom airflow. When done right you can get a fantastic vape from the GTA style but as with the RDTA I find sometimes you can get a dry hit if the juice is too thick and does not wick up the cotton quick enough. It is going against gravity so for a chain vaper it is not always ideal. Recently I took delivery of the above DJV Dejavu RDTA. Although I mention the style of tank is not my personal favourite, this specific tank is superb! I had to change my style of wicking a little bit for it to suit my style of vaping. But now I have it wicking to my liking, it is a super bit of kit. I was amazed by the presentation of the atomiser and the build quality is something to be marvelled at. This tank specifically was a creation by the YouTube reviewer Adrian Lo. He is looking to bring solid , beautifully made and very attractive products to the market. With this DJV RDTA he has done just that and it has changed my whole opinion on the type of tank. He is also very passionate about the quality and style of his products as you can see from the direct comments below from Adrian in an email about the tank. If you ask me, he has done exactly that with the DJV RDTA. Therefore, I am very excited to see what else comes from him!